We’d love your help. Let us know what’s wrong with this preview of Chocolate Roses by Joan Sowards. Janie Rose Whitaker’s world revolved around her chocolate shop until Roger Wentworth and his young daughter moved into the apartment across from Janie’s. Anyone would think Roger fit the mold of the “perfect” guy, but soon Janie discovers secrets that could keep them apart forever. Though she resists getting invol She’s in love . . .
To ask other readers questions about Chocolate Roses, please sign up. Recommends it for: Anyone who loves chocolate, dogs, honest, bravery, drama, love, and a good book. Recommended to jgyweniverel by: Saw in catalog and it peaked my interest. I loved reading this book. Jane Eyre is one of my favorite classics so I was a bit taken aback that someone would try (and succeed!) in making a modern day version of the tale. Janie is brutally honest about herself, it makes me wish that I could be like that, unfortunately we live in the real world, and everyone does love chocolate. I liked how Emily and Flo became best of buds. Instead of just mentioning casually that Janie owned a dog, Flo was made into a main character in herself, and if you c I loved reading this book. Jane Eyre is one of my favorite classics so I was a bit taken aback that someone would try (and succeed!) in making a modern day version of the tale. I liked how Emily and Flo became best of buds. Instead of just mentioning casually that Janie owned a dog, Flo was made into a main character in herself, and if you can't tell, I am a dog-lover. Chocolate Roses is a cute, light LDS (mormon) romance. This modern re-telling of Jane Eyre is creative, sweet and tastefully done. One thing I would have like to see was more of a friendship develop between Janie and Roger. For most of the book, I felt that their relationship was very one-sided and based purely on how georgeous Roger looked as he remained oblivious to Janie and her many charms. I am excited to see what this author will do next and will pass this one around to all my book friends Chocolate Roses is a cute, light LDS (mormon) romance. This modern re-telling of Jane Eyre is creative, sweet and tastefully done. Having never read Jane Eyre or an lds book before, I had low expectations for this book, but was pleasantly surprised. It held my interest. I LOVED this book, I thought it was hilarious and very tender...loved it, loved it, loved it. I was worried it would be a terribly predictable parody, with the un-original character names, but it was sweet and interesting. Janie Whitaker is in looovveee. With a man she sees for a few minutes every week, when he comes in to buy some chocolate to be delivered to a mysterious person at a mental institution. He barely acknowledges her, barely knows that she is there, yet she has an instant infatuation with him because he’s extremely handsome and has very sad eyes. Not really the stuff of inspiring romance - I could have used a little more character development with Roger Wentworth. He is a good man of course, but sinc Janie Whitaker is in looovveee. With a man she sees for a few minutes every week, when he comes in to buy some chocolate to be delivered to a mysterious person at a mental institution. He barely acknowledges her, barely knows that she is there, yet she has an instant infatuation with him because he’s extremely handsome and has very sad eyes. Not really the stuff of inspiring romance - I could have used a little more character development with Roger Wentworth. He is a good man of course, but since Janie hardly knows him, I hardly know him. The book has an LDS slant, and most of the main characters are Mormons, with one character converting in the book. Not being of that faith myself, I was a little confused at some of the things Mormons do as part of their religion, but it is not a major part of the book. When I first learned that Joan Sowards had written an LDS romance novel based on the novel "Jane Eyre," I was immediately intrigued. I remember reading "Jane Eyre" when I was seventeen and had my wisdom teeth out. Swooning over the dark and brooding Mr. Rochester was the only thing that made my recovery bearable. And Timothy Dalton did a very good job in the movie, much better than Orson Welles did, and ... well, this review isn't about Timothy Dalton, so we'll save him for another day. "Chocolat When I first learned that Joan Sowards had written an LDS romance novel based on the novel "Jane Eyre," I was immediately intrigued. I remember reading "Jane Eyre" when I was seventeen and had my wisdom teeth out. Swooning over the dark and brooding Mr. Rochester was the only thing that made my recovery bearable. And Timothy Dalton did a very good job in the movie, much better than Orson Welles did, and ... well, this review isn't about Timothy Dalton, so we'll save him for another day. "Chocolate Roses" is the story of Janie Rose Whitaker, a young lady who has devoted her life to building the success of her chocolate shop. She thinks about romance and marriage, but those things just don't seem to be in her stars. But she certainly does look forward to the one day a week when Mr. Roger Wentworth comes in to buy a chocolate rose. Her heart starts to pound, her breath quickens ... well, can't really blame her, when he's as good-looking as he is. When he moves in to the apartment next door, along with his cute little daughter, Janie has the chance to get to know him a little closer up. She likes what she sees, but his mood swings are off-putting, and when she learns his deep, dark secret, she suddenly understands why he acts the way he does. I finished this book last night, late, really late. While the book is a parody of Jane Eyre by Charlotte Bronte, it does not have the dark, foreboding style of Bronte's novel. Set in Mesa, Arizona the story revolves around...you guessed it...chocolate roses. The mysterious Roger Wentworth comes into Janie's chocolate shop and orders a chocolate rose to be sent to a gated mansion on Val Vista, and he always takes with him a whimsical chocolate piece, the first for his insane wife, Winnie and the I finished this book last night, late, really late. While the book is a parody of Jane Eyre by Charlotte Bronte, it does not have the dark, foreboding style of Bronte's novel. Set in Mesa, Arizona the story revolves around...you guessed it...chocolate roses. The mysterious Roger Wentworth comes into Janie's chocolate shop and orders a chocolate rose to be sent to a gated mansion on Val Vista, and he always takes with him a whimsical chocolate piece, the first for his insane wife, Winnie and the second for his charming four year old daughter, Emily. When Roger moves into the condos where Janie lives, she is further drawn into the intrigue of not only the mystery surrounding Winnie, but also those who will stop at nothing to convince Roger to change his story as a witness to a murder. I love the first person view point of Janie Whitaker as she tells her tail. I felt as if Janie had asked me to pull up a chair in her shop while she told me all about her adventures, sharing her inner most thoughts as if I was her sweet sister, Kylee. Everything about the character kept me grounded in the story. It was fun to watch in shocked amusement as she received two proposals in one week, one of which paralleled the story line of the original Jane Eyre to marry and travel to India. (SPOILER ALERT) I was not surprised by the fire which destroyed the mansion, and killed Roger's wife. Although the subtitle of Chocolate Roses by Joan Sowards is A Jane Eyre Parody, I didn't find the satiric aspects in the work that the word parody brings to my mind. I found Joan's novel to be much lighter than the original by Charlotte Bronte, but I would have called it a contemporary re-setting, or, given Joan's credentials as a consummate musician, an arrangement of Jane Eyre. Extracting a simpler plot from Jane Eyre for her novel was a good trick, and Joan pulled it off. She peopled the work Although the subtitle of Chocolate Roses by Joan Sowards is A Jane Eyre Parody, I didn't find the satiric aspects in the work that the word parody brings to my mind. I found Joan's novel to be much lighter than the original by Charlotte Bronte, but I would have called it a contemporary re-setting, or, given Joan's credentials as a consummate musician, an arrangement of Jane Eyre. Extracting a simpler plot from Jane Eyre for her novel was a good trick, and Joan pulled it off. She peopled the work with interesting minor characters and sub-plots that made the whole an enjoyable read. I liked Janie Whitaker; she was spunkier than Jane Eyre, and I found her to be in much the same circumstances as me long years ago: single and older than I thought I'd be before I found love and marriage. I'd macheted my way through many of the same emotions, and made similar bargains with God as Janie did. I'm glad she held onto her values despite the internal pressures, the gossips, and the jealousy swirling around her. Mr. Roger Wentworth (a tip of the hat to Jane Austen?) was a genuinely good man in a tragic situation, not the brooding, older man who tried to pull the wool over the eyes of a naive young woman and the community like Mr. Rochester did. I write conflicted characters who try to do the right thing, so I liked him, too. (Genre:LDS Fiction/Romance) 2 stars. Meh. I was rather lukewarm about this one. This book is listed as a "LDS Jane Eyre Parody" and it was okay. Not "bad", but not really good either. Jane and her sister Kylee are orphans that were raised by their eccentric Aunt Lucy. Upon reaching adulthood, the sisters open up their own chocolate shop. Kylee (the older sister) is married with 3 children while Janie is 27 and single. The highlight of Janie's week is Tuesday-that's when HE comes in the shop. Rog (Genre:LDS Fiction/Romance) 2 stars. Meh. I was rather lukewarm about this one. This book is listed as a "LDS Jane Eyre Parody" and it was okay. Not "bad", but not really good either. Jane and her sister Kylee are orphans that were raised by their eccentric Aunt Lucy. Upon reaching adulthood, the sisters open up their own chocolate shop. Kylee (the older sister) is married with 3 children while Janie is 27 and single. The highlight of Janie's week is Tuesday-that's when HE comes in the shop. Roger Wentworth is a very handsome man in a suit that comes to the shop every Tuesday to order a chocolate rose to be delivered to one Winnie Wentworth. Janie is besotted with Roger even though they have never had a conversation beyond his buying his chocolate. She knows nothing about him or his life, but she is in love. When he moves in next door with his 4 year old daughter, Janie is sure it is fate-they are meant to be together. I'd give this book 4.75 stars, if Goodreads would let me! 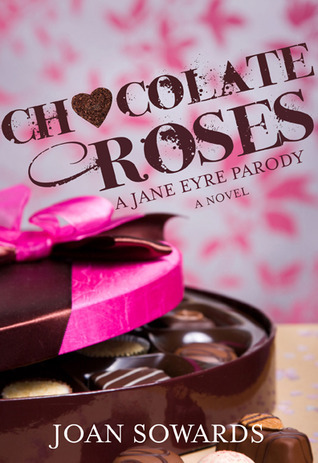 Chocolate Roses, by Joan Sowards, bills itself as “A Jane Eyre Parody” for LDS readers. Now, I have read Jane Eyre, and have even watched an adaptation on PBS, but both have been a very long time ago. So I’ll be honest…I had to look up a summary on Wikipedia.com to remind myself how the story went. Chocolate Roses can be enjoyed in its own right, but having at least a glancing familiarity with Jane Eyre will heighten your enjoyment even mo I'd give this book 4.75 stars, if Goodreads would let me! Chocolate Roses, by Joan Sowards, bills itself as “A Jane Eyre Parody” for LDS readers. Now, I have read Jane Eyre, and have even watched an adaptation on PBS, but both have been a very long time ago. So I’ll be honest…I had to look up a summary on Wikipedia.com to remind myself how the story went. Chocolate Roses can be enjoyed in its own right, but having at least a glancing familiarity with Jane Eyre will heighten your enjoyment even more. The protagonist of Chocolate Roses, Janie Rose Whitaker, is a wonderfully well-rounded character, as is her best friend and roommate, Flo the Great Dane. (Yes, I’m talking dog here!) This book is full of humor, sure to tickle many a reader’s funny bone, as well as romance and yes (being true to Jane Eyre) unavoidable tragedy. All are handled with a delightfully deft hand that makes this book very hard to put down. Chocolate Roses is clearly aimed at an LDS reading audience, being chockfull of LDS cultural and doctrinal references. But any church-going reader of any faith will likely find much to relate to here, too. Summary: One of the best LDS novels I’ve read in a very long time! Joan Sowards has been a friend to me for nearly twenty five years. Our relationship started with my asking help to notate some music on a computer program. She gave her time to me selflessly and was generous with her advice and skills in guiding me when I needed it. When my cousin Kerry Blair introduced me to ANWA in 1998 it was a warm surprise that our mutual friend Joan Sowards was part of the Daytimer’s Chapter. Joan’s new Book Chocolate Roses not only sounds good enough to melt in your mouth, Joan Sowards has been a friend to me for nearly twenty five years. Our relationship started with my asking help to notate some music on a computer program. She gave her time to me selflessly and was generous with her advice and skills in guiding me when I needed it. When my cousin Kerry Blair introduced me to ANWA in 1998 it was a warm surprise that our mutual friend Joan Sowards was part of the Daytimer’s Chapter. Good, clean LDS romance with intrigue, humor and chocolate. Janie and her sister own and run a high end chocolate store. Every Tuesday, a very handsome and mysterious man enters the shop and orders a chocolate rose to be delivered. Janie has a crush (obsession) on the man. Events take an interesting turn when he and his daughter moves in next door to Janie. Add the mystery of who the rose goes to, quirky characters and a crime and you have the mixture of a good story. The only problem I had was in Good, clean LDS romance with intrigue, humor and chocolate. The only problem I had was in my own head. I kept trying to compare it to Jane Eyre and that aspect of the book didn't work for me. The similarities were: reclusive older man with daughter; the main character is older; a crazy wife and fire. I did like the Jane Eyre quotes at the beginning of each chapter. I didn't recognize quite a few of them so now I really want to reread Jane Eyre. This story is a quick, witty read. I remember reading Jane Eyre for the first time in high school and absolutely falling in love with the story and characters. I also fell in love with Pride and Prejudice and have read many parodies of that story, but never one based off of Jane Eyre. When I saw this one, I knew I had to read it, although sometimes the retellings don't live up to the classic. I was very pleasantly surprised! Janie and her sister, Kylee, were orphaned and raised by an aunt. After graduating from college, they took I remember reading Jane Eyre for the first time in high school and absolutely falling in love with the story and characters. I also fell in love with Pride and Prejudice and have read many parodies of that story, but never one based off of Jane Eyre. When I saw this one, I knew I had to read it, although sometimes the retellings don't live up to the classic. The main character Janie is likable from the start. She is 27 years old and still single. In the LDS world, that is not necessarily a fun thing to be. I can say this, because at 27 I was still single. I could relate to everything she was lamenting about. The thing I loved about Janie, is the way that she tries so hard to include humor into her outlook on life. Her best friend is her dog "Flo", her great Dane. I haven't read a book in a long time, where a pet had so much personality! Flo is her b The main character Janie is likable from the start. She is 27 years old and still single. In the LDS world, that is not necessarily a fun thing to be. I can say this, because at 27 I was still single. I could relate to everything she was lamenting about. The thing I loved about Janie, is the way that she tries so hard to include humor into her outlook on life. Her best friend is her dog "Flo", her great Dane. I haven't read a book in a long time, where a pet had so much personality! Flo is her best friend that is always there for her, keeping her sane throughout the story. Another great aspect of this book, is how well Joan writes all of her characters, not just the main female and male leads. All of the people who work in Janie's chocolate shop are also well developed and have fun side stories. Many authors are currently rewriting Jane Austin's works with a modern twist. Most of those are thinly-disguised updates that are poor imitations of the original. "Chocolate Roses", however is fresh and original. Janie Rose Whitaker is a complex and interesting character, a mix of independence and self-doubt. Joan Sowardsmanages to infuse this story with tragedy, comedy, and romance. Not only will LDS readers find a clean, compelling, and fun read, but this story can be enjoyed by readers of all Many authors are currently rewriting Jane Austin's works with a modern twist. Most of those are thinly-disguised updates that are poor imitations of the original. "Chocolate Roses", however is fresh and original. Janie Rose Whitaker is a complex and interesting character, a mix of independence and self-doubt. Joan Sowardsmanages to infuse this story with tragedy, comedy, and romance. Not only will LDS readers find a clean, compelling, and fun read, but this story can be enjoyed by readers of all faiths. Take your time and savor this book just like gourmet chocolate.....without the calories! I really enjoyed Chocolate Roses by Joan Sowards! In fact, I enjoyed it so much that I wished I had time to read it straight through. Sowards' humor throughout the read and description of the various locations in this book were right on. I could easily envision the mystery, love, and heartache of love and love lost which she shares to build to a surprising and fulfilling climax. I wish the chocolate shop she writes about existed, I would surely be a fan of it as well! WOW! This book was GOOD! Janie is a chocolatier and she has a favorite customer! I won't give it away...you MUST READ! Sweet, clean romance with rich morsels of humor. I was pleasantly surprised by this book. I'd seen in reviews on goodreads that many prefered the author's first book so I was prepared to be disappointed. I've found in life that if I have low expectations of books or movies that I often end up enjoying them. I enjoyed this book more for the writing style and humor of the main character, Janie, than for the romance. I chuckled to myself many times. It was very clever. I liked it, but I was very scared to read it. I remember the plot of Jane Eyre and wasn't sure how that would translate happily to an LDS novel. I am very glad that I am married, because if I was "older" and single and attracted to a married man, YIKES! I was sorry to see the wife die, and how much Janie was so depressed when she couldn't have "her" man. I think this was very well-written, I just don't like the whole coveting after someone else's husband (or wife), no matter what. Seriously! That is how it ends?!? I wanted so much more and I totally let down when I got to the last page. . .but I'm thinking the story I read wasn't complete. The story was good. Fun and enjoyable. I haven't read Jane Eyre in a REALLY REALLY long time so I didn't have anything to compare it to. Good characters. Chocolate-YUM!!! It was a quick read. I liked it...except for the ending. It was so predictable (even with it being a Jame Eyre parody) that I cringed when I stuttered through the ending. I enjoyed all of the characters and appreciated the LDS theme and how the author often "spoke" to the reader. Overall it was a sappy, clean romance novel that caught my interest and held it until the end. This review has been hidden because it contains spoilers. To view it, click here. I wanted to like this so much, because I love Jane Eyre. However this was a disappointing novel. I didn't like the relationship between Roger and Janie, I felt underwhelmed. I didn't buy that they actually cared about each other. Janie was just a creepy stalker, and Roger just used her as a babysitter until his wife died. I'm being a little dramatic, but I just didn't like it. I am not a big chocolate lover (I would rather eat potato chips), I absolutely hate dogs that slober in massive quantities, and I have never read Jane Eyre. However, I found this book to be quite cute. I loved the chapter quotes from Jane Eyre at the beginning of each chapter - maybe that should be my next book to read! So, no surprise that I didn't really like this modern day LDS Jane Eyre parody. In fact, I never would have picked this up to read on my own. (I read it for book club.) But, it was a quick read...and definitely wasn't as bad as I thought it was going to be. So that's saying something! This is an entertaining modern day LDS parody of Jane Eyre. While I don't remember reading Jane Eyre it has now inspired me to do so with each of the quotations listed in the chapter headings. Be prepared to crave chocolate as you follow chocolatier Janie Whitaker and her interesting relationship with the handsome and mysterious Roger Wentworth. This review has been hidden because it contains spoilers. To view it, click here. I actually liked this book at first until she brought in the fact that the main girl was in love with a married man. Way to ruin it for me. And then to kill off the wife so the characters could be together just rubbed me the wrong way. UGH!